In order for a product to perform its optimal effect on the skin, it is important to pamper, cleanse and scrub the skin. When you exfoliate, you remove dead skin cells while stimulating the formation of new skin cells. Take a hot shower before exfoliating to open the pores and make your skin more receptive towards the exfoliation. By cleansing the skin trough scrubbing or exfoliating, you minimise the risk of impurities. 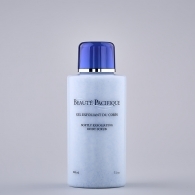 After exfoliating your skin, it is important to nurture it with a moisturiser that nourishes your skin with moisture.